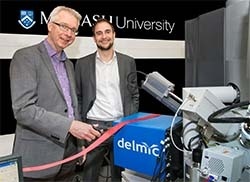 Image: Professor Albert Polman, (FOM Institute AMOLF and University of Amsterdam) (Left), inventor of the SPARC cathodoluminescence system, and Dr Sander den Hoedt, (CEO, DELMIC BV) open the Monash facility. We at DELMIC are very pleased with the outcome of our recent trip to Melbourne and Singapore. 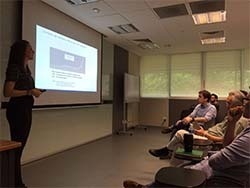 Our seminars on cathodoluminescence and correlative light and electron microscopy held at the National University of Singapore had a very engaging audience and generated a lot of interest in the benefits of these microscopy solutions for materials science and life science, respectively. We had some enlightening discussions and would like to thank everyone who took the time to attend our seminars. 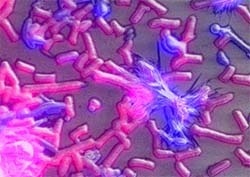 We are excited to announce that we will be hosting an informative webinar on the uses and applications for correlative light and electron microscopy (CLEM). At the webinar, we will be providing an introduction to CLEM, featuring our own high-performance CLEM system, the SECOM. This introduction is provided by DELMIC’s in-house CLEM specialist, Lennard Voortman.